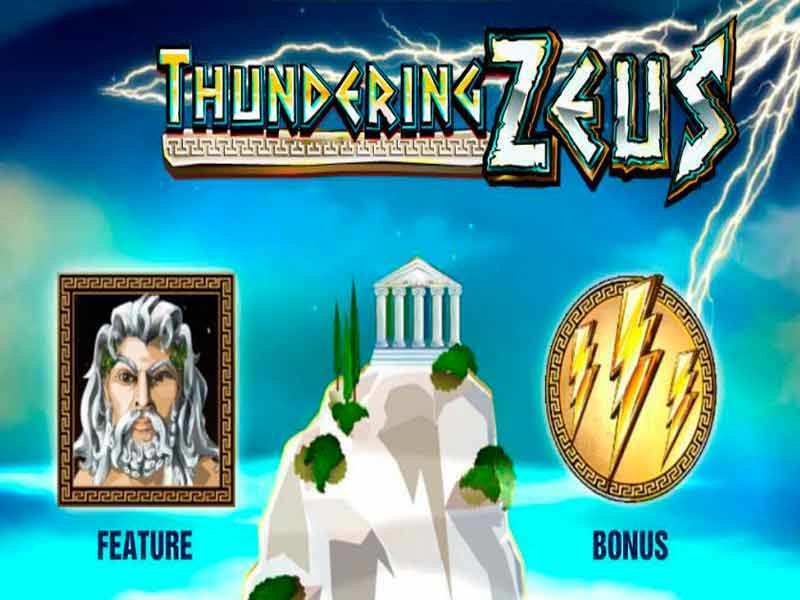 Thundering Zeus slots is an online game provided by Amaya Gaming. Like many other popular games created using the Greek and Roman mythology theme, this slots game is available at any online casino and can be played for real money. This game has 5 reels and 20 pay lines. The game is set under a blue sky with temple columns framing the 5 reels. Symbols in the game include the basic card symbols of J, Q, K and A. The next batch of symbols include a harp, a vase, the gods Pan and Zeus himself. The coin sizes range from 0.02 to 1. To adjust the coin size, use the ‘Up’ and ‘Down’ arrows. Click tabs 1,2,3,5 or 10 to set the number of coins per line. Click on ‘Spin’ to start playing. The ‘Autospin’ feature is also available to set the reels in motion for a given number of times. Zeus, the god of sky and thunder is the wild symbol in this game. This can substitute for all other standard symbols in the game except the lightning bolt. If you land this symbol on reel number 3, it will expand to reward you with 3 free spins. This gives the player more chances to create winning combinations. The lightning bolt gold symbol acts as the scatter symbol. If you land this symbol on reels 2,3 and 4, you trigger a mini-game. The bonus game has a screen showing Mount Olympus which will be displayed with 9 lightning bolts. Click on each bolt and match three of them to view the number of free spins received and the multiplier at which you won the free spins. Sit back and watch as your free spins earn you much more winnings. You can get 7 free spins with a 2 times multiplier or 15 free spins with the same multiplier. You could be really lucky and get 20 free spins with a 3 times multiplier. Thundering Zeus has no progressive jackpot feature but has a base game jackpot of 10,000. The Return to Player rate is about 97%. The Autospin feature makes it much easier to play ensuring you do not have to click the screen every time. The mini game that provides free spins as a bonus ensures your gaming experience gives you winnings every so often to keep you glued. The game is characterized by sounds of thunder and lightning in the background as you play the game to achieve the desired effect of drama and excitement. The graphics are some of the best to ensure the gaming experience is enjoyable. For more Ancient Greek themed online slots game, you can check out Zeus 3 or the Legend of Zeus available online. You can play these games for free or for real money. Other games developed by Amaya Gaming include Caesar Salad, Conan the Barbarian and Battle for Olympus. 0 responses to "Thundering Zeus Slot"